Bulgaria is brimming with history, culture, natural beauty – from Thracian Tombs to Bulgarian Kings, UNESCO Sites, picturesque cobblestone villages, mountain ranges, black sand beaches, and Rose Festivals! Here are some recommendations and highlights from travels to Bulgaria starting in Sofia – the modern capitol, and continuing to Veliko Tarnovo – the old capitol. Get ready for the best places to visit in Bulgaria! Today’s capital of Bulgaria is an exciting city to visit where you can find parks, museums, modern shopping, and delicious Bulgarian cuisine. Walking Tour of the main town to see the Royal Palace, churches, landmarks & monuments: St. Sophia Church, Rotunda of St. George, Vasil Levski Monument. There are 250 historic, archaeological and architectural monuments – helpful to contact the local tourism office, or meet a local guide to walk this city. 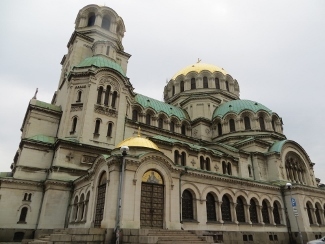 Alexander Nevsky Memorial Church: Bulgarian Orthodox Church built in the early 20th century, and is one of the largest Eastern Orthodox cathedrals in the world. 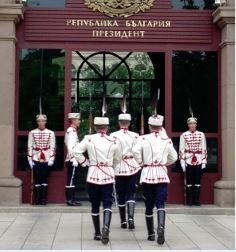 Changing of the Guards: Visit the Presidency Building where the Bulgarian President’s Office is, to see the guards change every hour on the hour. Good to note: If you are in Sofia on the first Wednesday of the month at 12:00 noon, you will see the full pomp and ceremony where there will be music, shouting & weapons. 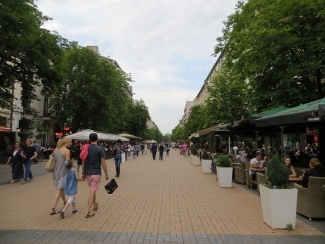 Vitosha Street: Everyone seems to flock to this pedestrian street lined with sidewalk cafes and shops. Boyana Church: Located about 20 minutes from the town center, you can visit one of Bulgaria’s UNESCO treasures – a quaint church dating back to 1259 set amongst a garden with pine trees. Important! You must make a reservation in advance to tour the church with a guide. History Museum to see the Thracian Gold collection – located near the Boyana Church. 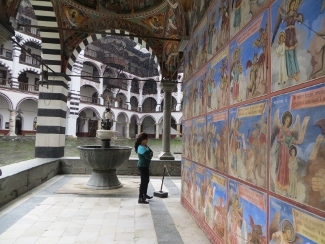 Day Trip: Take a day trip to visit the Rila Monastery, a UNESCO World Heritage Site just 2 hours from Sofia. The biggest monastery in Bulgaria where you can visit the church, monastery, museum. 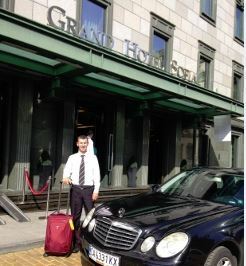 Grand Hotel Sofia Located in the heart of Sofia, you’ll find Grand Hotel Sofia, a luxury 5 star hotel. 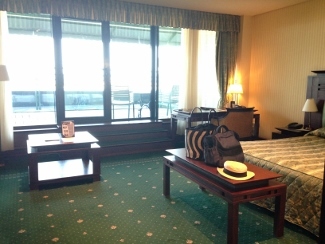 My room was spacious, clean, with a private balcony, and a beautiful bathroom – complete with Bulgarian beauty products & bath salts! The concierge and staff provide helpful information on where to go & dine. Be sure to look at the hotel gallery on the main floor where you’ll view art from Bulgarian artists. Moma A favorite and a must on our best places to visit in Bulgaria! 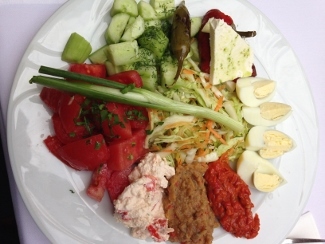 Lots of traditional Bulgarian dishes to choose from served either indoors or outdoors. Love the interior design and beautiful photos of Bulgarian beauties inside. 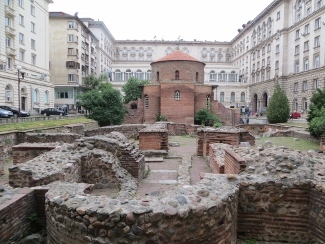 The old capital of Bulgaria with 7,000 years of history! 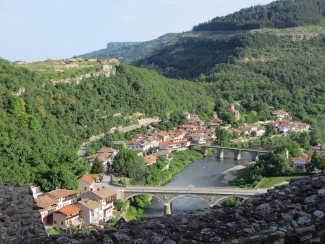 The town’s medieval homes are stacked on sloping hills that resembles an amphitheater. There’s lot to see and learn about this charming town – palaces, museums, towers, bridges, and a fascinating history of Bulgarian Kings. Walking Tour of the City – Free! 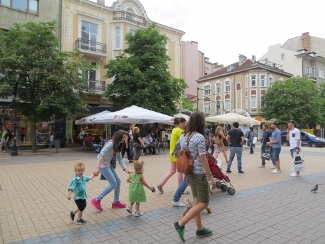 If you want to join a group to walk the city, check with the tourist office on meeting times and place. The Main Street where you can shop at shops, boutiques, and art galleries that represent local artists. 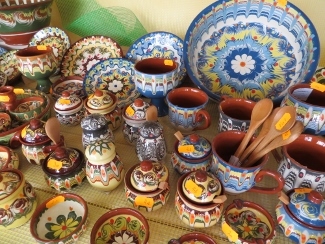 A favorite souvenir from any Bulgarian town are the famous Bulgarian rose products – lotions, soaps, bath salts! 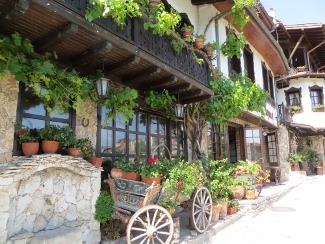 Old Quarter, Samovodska Street, you can find artisans and small workshops with Bulgarian crafts like wood carving, coppersmiths, and master painters of icons. 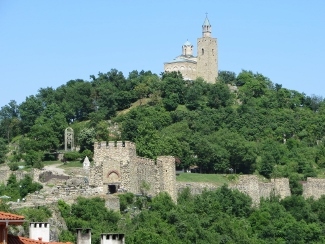 Tsarevets Hill – Main Fortress of the 11th century medival capital Veliko Tarnovo, where you can find massive stone walls, gates and towers. Don’t miss! 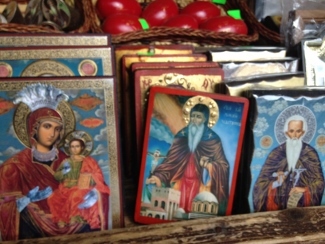 Visit Patriarch’s Church on top of the fortress hill, and see the paintings & murals inside. Carevec Hill, where you can watch the “Sound and Light Show”, presenting an overview of the town’s history. 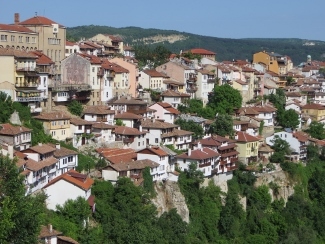 Visit Arbanasi, a medieval town dating back to the 15th century (only a couple miles away from Veliko Tarnovo). In the 17th century, Arbanasi became an important trading center. Visit old village homesand learn more about the history of this village. Hotel Gurko The authentic family-run bed and breakfast is full of charm, decorated in the old Bulgarian manner. Hotel Gurko is a timbered 3-story charming inn is located on Gurko Street, in a neighborhood with lots of traditional Bulgarian buildings from the 18th century. Almost all 21 rooms have a private balcony with geranium filled boxes, and overlook the Yantra River and Sveta Gora Hill. Just a few minutes away from the town’s Main Street and well-known Carevec Hill. 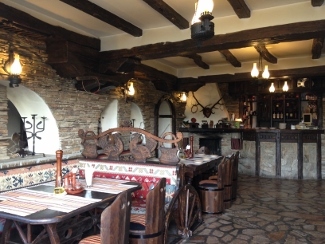 Shtastlivetsa is one of the best dining options in this Bulgarian town offering traditional Bulgarian dishes. Be sure to sit on the terrace that overlooks the river and town below. 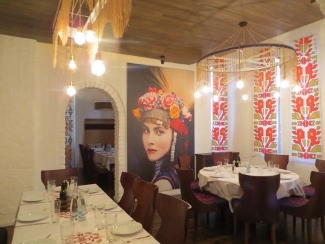 Hotel Gurko Restaurant has a lively restaurant downstairs that resembles an old tavern. You can dine on traditional cuisine and try the regional plum and grape brandy. 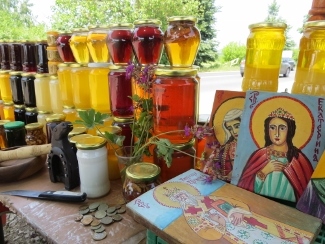 Good to note: If you can plan your visit to Bulgaria around a festival date, you can experience some of the colorful folk traditions, like the Bulgarian Rose Festival that takes place in Kazanlak each year in May. Check with the tourism office on exact dates. Bulgarian Tourism Office: In preparation for your trip, check the official tourism site for Bulgaria for ideas on where to go and what to do. 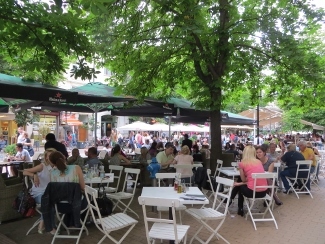 Sofia Tourism Office: Learn about Sofia – where to go, what to see, where to dine & more! 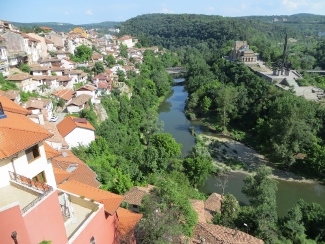 Veliko Tarnovo Tourism Office: Learn about Veliko Turnovo – where to go, what to see, where to dine & more! Exeter International: Need help planning & booking your trip? Contact Alex Datsev to customize your travels. 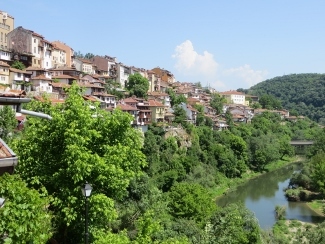 Good to Note: We visited Viator website to help us find the local guides for Bulgaria. 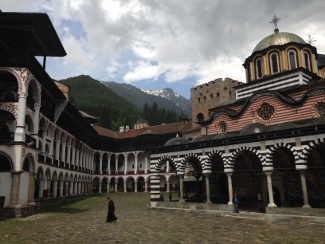 Rila Monastery to Sofia: Sixt provides car rentals or private chauffeurs who can drive you throughout Bulgaria. 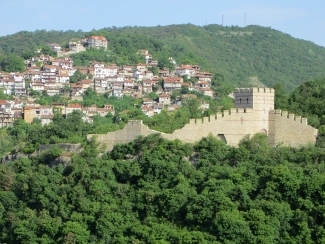 Sofia To Veliko Tarnovo: Sixt provides car rentals or private chauffeurs who can drive you throughout Bulgaria.